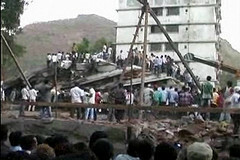 Taking 74 lives, a building collapsed in Thane. Thane building collapse pointed to the depth of corruption existing in the real estate sector. Thane building collapse raises questions over the corruption level in the realty? THANE: An illegal building collapsed in Thane. Thane building collapse reveals the level of corruption existing in the real estate sector. Two builders Jamil Qureshi and Salim Shaikh have been detained by the police. Nine people were accused in the building collapse case and all of them were arrested by the police. They are sent to the police custody for two weeks. Police officials said that the clearance for the construction was attained through bribery. The civic officials were bribed by the builders.